Heading into the holiday season, there have been lots of big updates from major digital platforms. You’ll see that reflected in the sheer length of this article. The updates have actually doubled since our previous post in October: 17 Digital Marketing Updates Recap October 2017. Here is a list of our monthly digital marketing news posts. Google Attribution allows you to analyze your marketing campaigns more holistically. This helps marketers measure how higher-to-mid funnel initiatives contribute to conversions in a cross-device and cross-funnel manner. – Your prospective customer sees your ads through social media on mobile. – They google your brand name to find out more about your product and send an inquiry via their desktop. Based on the last click attribution model, Google Search on desktop will get all the credit for the conversion. However, the customer wouldn’t have been converted without that social media ad prior to their search. In this case, the social media ad should garner as much, or even more, credit than organic search. Google Attribution may help this problem. This update gives marketers gained access to Google Attribution to tap into the true paths customers take before the conversion happens. For more information, visit Google Inside Adwords. Once you set it up, you can accept bookings through Google and can track bookings that have come through Google. 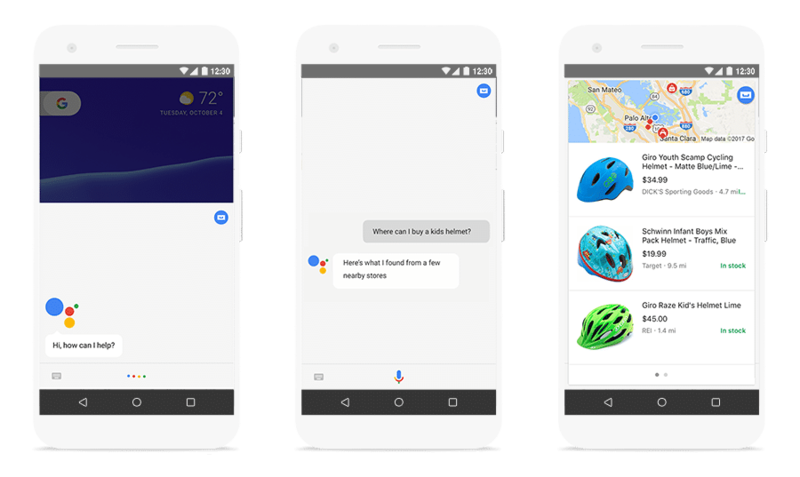 Google launched ‘local inventory’ on Google Assistant. It helps customers find products available in stores near their location simply by asking Google Assistant “Ok Google, where can I buy _____ nearby?”. 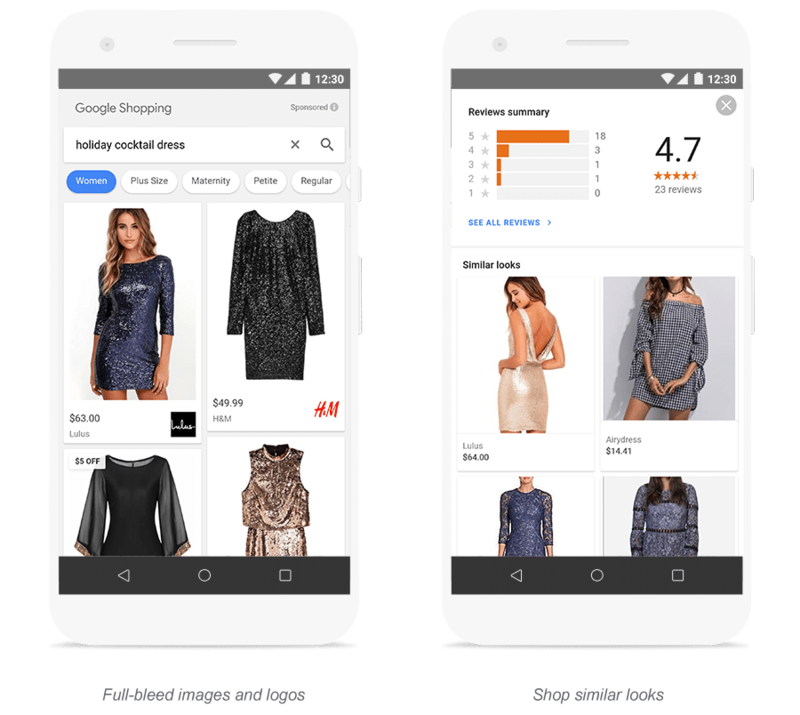 In order to display products in the results, you need to set up Google Shopping Local Product Inventory Feed and then your products will automatically appear. 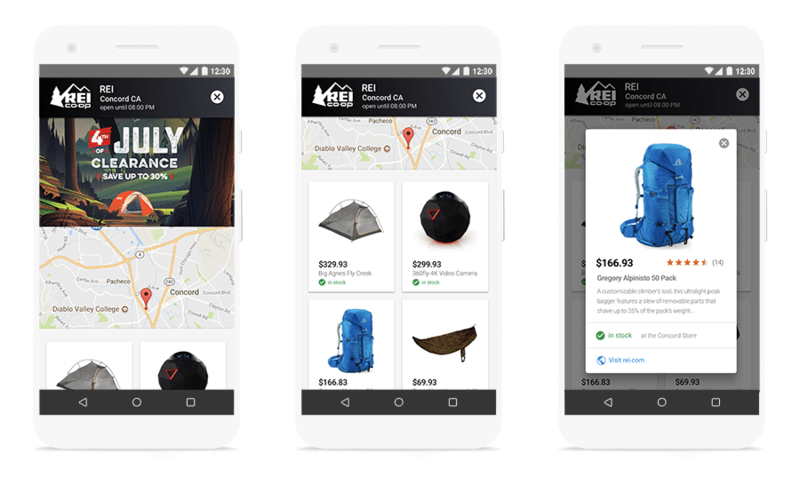 Google launched the pilot of their new Google Shopping local ads to drive foot traffic to local stores. In order to activate the pilot account, contact your Google account team. Google finally started small testing their Mobile-first index for some sites. Google’s spokesperson, Gary Illyes, hasn’t said anything except “Don’t freak out.” They are still in testing phase and websites that aren’t ready for Mobile-first index might not be moved to Mobile-first index, which means you’ve still got time if your website isn’t ready. If you’re wondering whether your website is ready, here’s a useful slide shared at the SMX East Conference by Leslie that gives you a checklist of mobile audit. Now Google can display wait times for restaurants when simply searching the name of the restaurant. Google updated their interface of product related knowledge graphs. Now viewers can see pretty much any information they want for product research. This includes the user reviews, editorial reviews, as well as stores you can buy it without ever needing to access a website. Along with their update, Firefox Quantum, Firefox has replaced Yahoo! with Google as their default search engine. Though Firefox users account for 9.1% following Google Chrome (58.8%), Safari (13.4%), Internet Explore (9.8%) according to W3C Counter, you might see an increase of Google usage as a result. Facebook stated they wanted to show more posts from friends and families rather than business pages users don’t follow by cutting organic post reach to the businesses. That being said that, no one uses the Explore Feed. This means Facebook would need to develop a huge design change to navigate users to the Explore Feed. With this in mind, the update won’t significantly improve the challenge that businesses are facing: gaining reach through Facebook. There are also arguments that Facebook may move all posts from business pages to Explore Feed, which means the death of Facebook organic reach for business pages. They have been testing this initiative in Slovakia, Sri Lanka, Serbia, Bolivia, Guatemala and Cambodia. A Journalist in Slovakia, Filip Struhárik, reported biggest drop in Facebook organic reach. On a bright side, Facebook doesn’t currently have any plans to roll this test out globally according to the head of Facebook News feed. 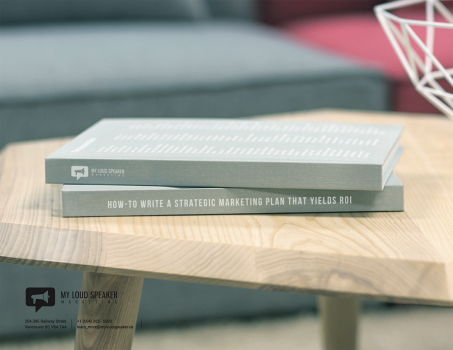 Here’s a couple things to keep in mind for Facebook marketing. First of all, Facebook has been a pay-to-play-platform, you have to pay to obtain customer reach. It’s still worth it to invest your money given that Facebook isn’t that expensive and allows you to focus on your target. Secondly, when you post your content on Facebook, make sure you’re not putting out hundreds of meaningless posts or clickbait content. Facebook is more likely to show meaningful, informative, accurate and authentic content because that’s the content Facebook users like – see these basic guideposts for more details. 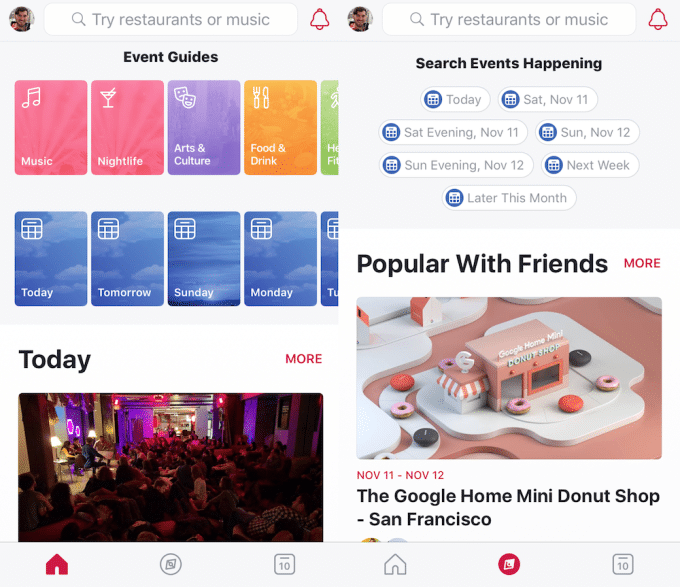 As part of the monetization of Facebook Messenger, Facebook has rolled out tests of interstitial and video ads with a limited number of games. 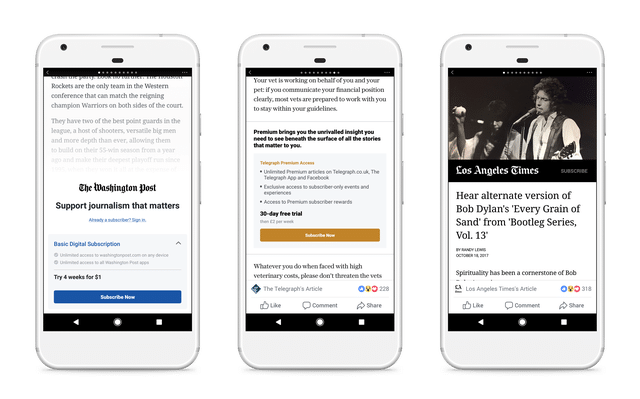 As part of The Facebook Journalist Program, they’ve started testing news subscriptions in Instant Article with major publishers such as The Washington Post, The Economist and so on. On Instant Article, Facebook will support a paywall and the publisher can control the limitation of articles that readers are able to read – currently 10 articles – as well as the choice of open and gated content. If it’s paid content and readers subscribe, the publisher can get 100% of the revenue. Facebook wants the ability to sell ads for the publisher’s content. Possibly, this could become one of the ad options we can leverage through Facebook’s ad platform. Similar to Youtube’s Director Mix, Facebook launched the Dynamic Creative option that automatically delivers a series of ad variations based on headlines, text, images and videos added. 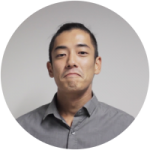 It also helps analyze which variations work best for which audience and placement, significantly streamlining the process of A/B testing. With the launch of Dynamic Creative, they’ve also rolled out Asset Customization which allows you to customize creative assets based on each ad placement making the advertiser’s job way easier. Facebook expanded Dynamic ads for travel to their collection ad format. They’ve added two more exciting features: broad audience targeting and social context addition for dynamic ads for travel. For broad audience targeting, Facebook lets you promote relevant hotels based on the user’s behavior. All you have to do is select a broad audience. Social context addition to dynamic ads allows you to show friends who have visited a city, which makes the ads feel more relevant and helps to convert users. With the advent of political issues tied to their platform, Facebook pushed their advertising transparency efforts even further. Starting in November or December in Canada – and next summer in US – users will see all active ads that business pages are running by simply clicking “View Ads” on the business page regardless of whether they’re the targeted audience. This will definitely change the game for Facebook and Instagram advertising, given advertisers will be able to see the active Facebook ads of their competitors. Facebook has added a polling functionality to allow individuals and businesses to conduct quick surveys with the limitation of two choices to each question. Users can simply tap one of the choices and won’t have to bounce out to another website or app. It’s not only businesses that can get feedback more easily, businesses and brands can interact with their fans in a new way on Facebook. 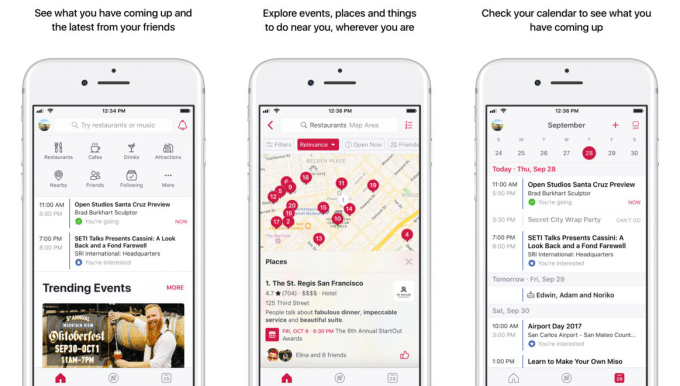 Launched solely in the US, Facebook Local helps users discover restaurants, bars and activities nearby. Facebook is now directly competing with not only Yelp and Foursquare, but also Google as a platform for local needs. Given Facebook’s competitive advantage in terms of precise demographic data including friends, age, education and so on, it’s conceivable that they’ll step ahead of the game. If this initiative goes well, it will significantly increase the importance of Facebook business setups and Facebook location pages. Facebook threw a couple of new features our way to streamline the process of international targeting, including Dynamic Language Optimization, Multi-country Lookalike Audience and Multi-city Targeting. Dynamic Language Optimization will match the right language to the right person. Previously, advertisers had to create separate campaigns for each language. Multi-country Lookalike Audience lets you choose multiple countries for lookalike audience without repeatedly creating lookalike audience one by one for each country. Lastly, Multi-city Targeting: now you can pick cities based on population size. You no longer have to research population and manually add those cities into Facebook’s location targeting. The Minimum population starts from 100,000. Starting Feb 6, 2018, Facebook will disable a series of valuable functionalities for third party websites and apps such as Native Like Button, Like button in third-party mobile apps, App invites and comment mirroring. As a result, people will not be able to tap a button in a brand’s app to “like” its Facebook page or an article in a publisher’s app to help boost its reach in Facebook’s newsfeed. However, developers can opt to create their own buttons within their apps that link to their Facebook Page so that people can tap those buttons to open Facebook’s app or mobile site to the developer’s Page and “like” it, said a Facebook spokesperson. It seems as though Facebook wanted to separate those third parties from their platform. If your app and website have these tools and rely on them, you have time to make some adjustments prior to February 6. Twitter launched #Fuel, a team to help brands develop their content strategy on Twitter. It seems Twitter is leading transparency for the digital advertising realm. 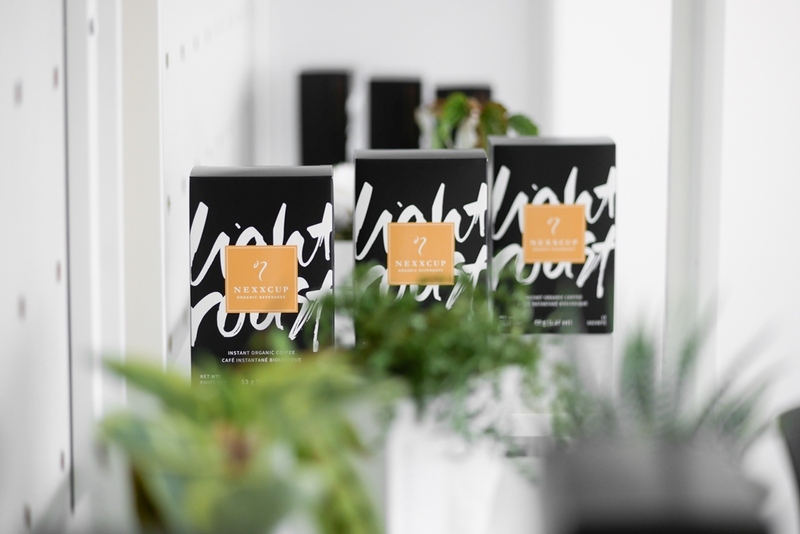 They will launch this program in the US as the first location to test. Twitter has been testing their new character limit of 280 as we mentioned in our previous post. They’ve now made the new character limit official. Though the new character limit hasn’t been applied to advertising yet, it will be available in the coming months. Targeting small businesses, Twitter launched a subscription model for ads into public beta. For only a $99 monthly subscription fee, you can promote your tweets without setting up anything additional for each post. It doesn’t give you robust targeting options: the options are country – currently the US or UK – interest or location. It’s definitely aimed at small businesses as their FAQ mentions. Small businesses or personal accounts under 2,000 followers will get the most value. This program is only available in the US and UK followed soon by Japan in the near future. Partnering with outside experts, Youtube took one step ahead on fighting violent content to make Youtube a safer place for viewers and brands. They also created an action for videos that don’t violate their guideline, but contain controversial content by putting them behind a warning wall and disabling comments, likes and recommended videos from these videos. Youtube invented a new way for artists to offer their live tickets to fans. Partnering with Ticketmaster, they’ve started featuring upcoming tours in the US for hundreds of musicians. Lead Gen Form, which LinkedIn originally launched for sponsored content, is now available for InMail ad campaigns. This InMail ads open the door to desktop and mobile, given the Lead Gen Form for sponsored content is only available on their LinkedIn App. According to LinkedIn, Lead Gen Forms for Sponsored InMail saw their mobile conversion rates increase by an average of 3x when compared to standard landing pages. LinkedIn also debuted new dynamic content ads to allow users to download whitepapers and e-books within the ad, meaning they can complete the download with a few clicks. Though the new ad formats may bring more leads into the sales funnel, one thing to remember is the easier they sign up, the less likely they are to convert. It’s worthwhile to give them a shot, but you need to keep a keen eye on the end goal – sales – to measure their true performance. Instagram removed a restriction wherein users are limited to videos and photos taken in the last 24 hours for insta-stories. The original concept of Snapchat’s platform, stories are intended to disappear after the 24 hours pass. Without the restriction, this opens up flexibility for businesses to spend more time on their story content after photos and videos are taken. Finally, Snapchat launched a conversion tracking tool called Snap Pixel. It’s only available for vertical-video ads. Bing expanded their shopping ads to Canada & India. In Canada, Bing Shopping Campaigns only support English but not French. Bing shopping ads for black friday 2017 are now live. Their flyer page is a one stop shop to find ads from major stores in the US. 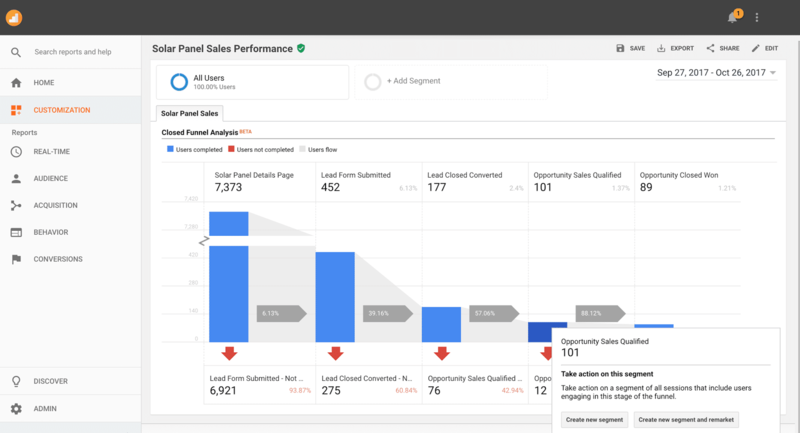 Sales data from Sales Cloud will be available in Google Analytics 360 and more. With this update, you are able to see customer journey from site visit all the way to closing seamlessly. Pinterest invented a Custom QR Code for business. This gives you the behaviors and preferences of PayPal shoppers on a merchant’s site and so on. They updated their advertising report tool by conversion pixel and mobile app install attribution. There have been lots of shopping ad updates as we move towards the holiday shopping season. We can see key patterns happening in digital media: Transparency, Localization and In-App Experience. Many brands paused their ad campaigns after they noticed their ads were running beside extremist or controversial content. Led by P&G who is the biggest advertiser in the US and has slashed their digital ad spend, more and more businesses are demanding the transparency of ads. As demonstrated by Twitter and Facebook’s transparency effort, we are more likely to keep seeing this trend in the coming months. 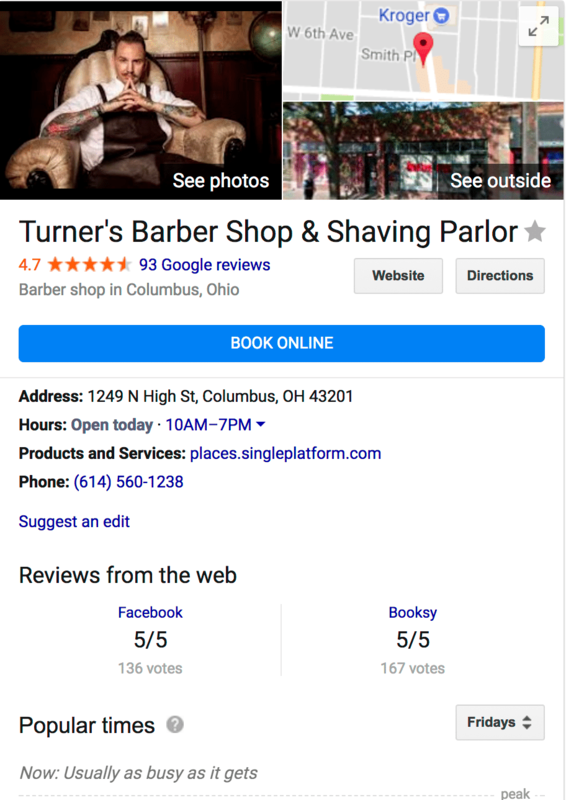 As illustrated by the Google Shopping ads for local stores and updates on Google My Business’s UX, Facebook’s new app, Facebook Local, the focus is geared towards local. There’s much more happening in technology to measure data for local businesses, such as CPIV. Lastly, more digital platforms seem to be making the user experience complete within their app or services. For example, Facebook decided to cut out third party tools such as Native Like Buttons and App Invites and LinkedIn pushed Lead Gen Forms to InMail ads.